Dan Carr recently sent me a document that I think is very important to the history of Kagnew. 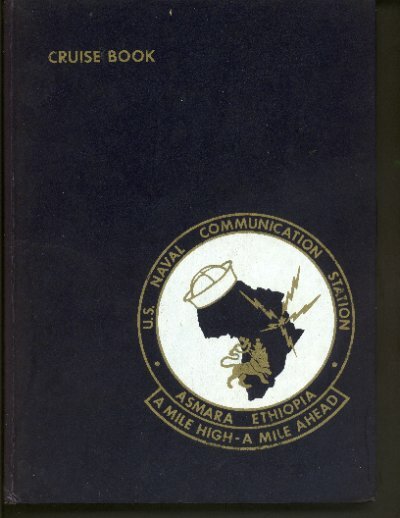 It is the Navy Cruise Book, probably the last full-year document of life at Kagnew as we knew it. I am in the process of scanning this document into pdf (Adobe Portable Document format) and will be posting the entire book on the Kagnew page. This is so you can view it at home exactly as if you were looking at the book. If you haven't already, you can download the Adobe Reader at the Adobe web site and install it on your machine. You should do this anyway as pdf files are very common on the web and the program can be very useful to you. Because of the nature of these files, giving you graphics and text, they can be very large. I am trying to break the book down into sections so you won't have to download the whole thing at one time. I will provide the links below, and once you have them all downloaded to your hard drive, you can view the entire book. Or you might want to download particular sections that interest you. Anyway, I want to thank Dan Carr and Randy Harris for providing this valuable document and hope you enjoy it. I also want to thank everyone on the Sponsor's Page for their financial support. Without that, I seriously doubt that this book would have been published on this site.